September has continued to be an exceptional month weather wise and its great to see so many members enjoying the continued good weather. Whilst there haven't been any blog posts for a couple of weeks there have been plenty of good soaring days and many good achievements. Last week (Wednesday 19th) saw many flying Glyn's task of Lynham, Lasham and Didcot (315, A2 & 325) plus a lot of other single seaters merely enjoying the excellent soaring. John Hubberstey finished his Silver C with a quick 50k to Enstone - he was a little too enthusiastic with his first pull off at 700' (worried about the 1% rule) and landed back but was not deterred and launched again and got to Enstone in about 2 hours. Saturday was again busy with lots of you out enjoying the light winds and reasonable thermals. This week has produced a strange mix of weather with a funnel cloud appearing to the west of the airfield and this evening a strange and eerie low level mist drifting in across the airfield. We also saw another first solo by way of Andy Tobias (our local friendly AME) in CFA. He has been flying with us in between giving CAA and most recently EASA medicals on the airfield. Congratulations to him and anyone else who has achieved anything special recently. The current run of good weather has seen a lot of activity at Booker this week (and it looks likely to continue). Tuesday's weather provided good streeting conditions with cloud bases in exces of 4,000' and HA, Z3 and AJ did a 200k task at over 100kph out to Chiping Norton, Thame, Chipping Norton and home. The Duo Discus did a Bicester Didcot with Graham Morfey at the helm. There has been plenty of training going on and Basic course member Daniel Pollard solo'd in CFA. We were treated to a spectacular flypast of a couple of BBMF spitfires Thursday evening. 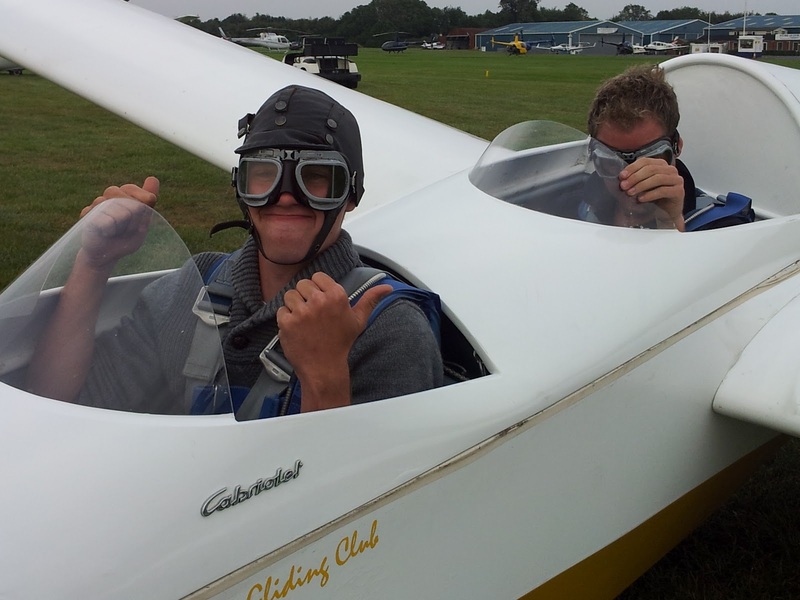 A grid was set up ready to take advantage of the good soaring conditions on Saturday with a mix of training 2 seaters, private single seaters and a vintage group Wassamer Super Javolet. Simon Vardigan and Chris Arnold converted to the Pegasus and K18 respectively. And lastly not to be outdone and continue the theme of open top flying we have a picture of Graham Saw from his recent trip to Lithuania in a Hol's der Teufel. 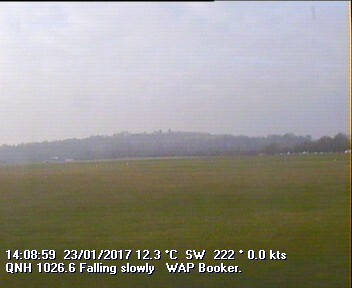 He claims his '6 second flight (with handicap is about 5 hours in plastic gliders)', with a glide ratio of 13:1 perhaps he is right? 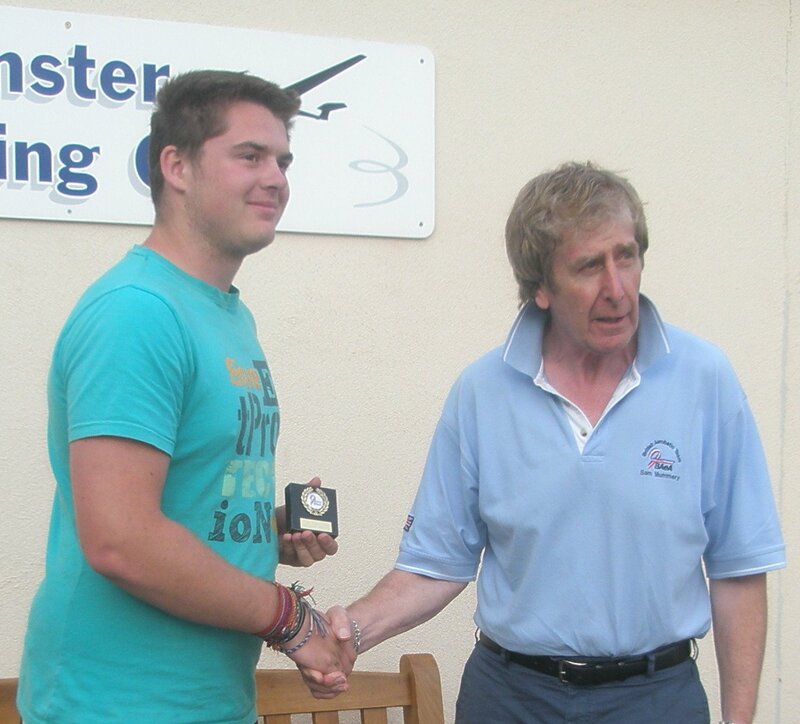 Guy Trees entered the 'Saltby Open' aerobatic glider comp at the weekend and won in the Beginners Class. His overall accuracy of the figures, positioning in the 'box' and harmony marks were obviously good as he zeroed one of the figures and still won ! Photo shows Guy being presented the medal by Sam Mummery, a legend in the glider aerobatic world, representing the British Aerobatic Association. 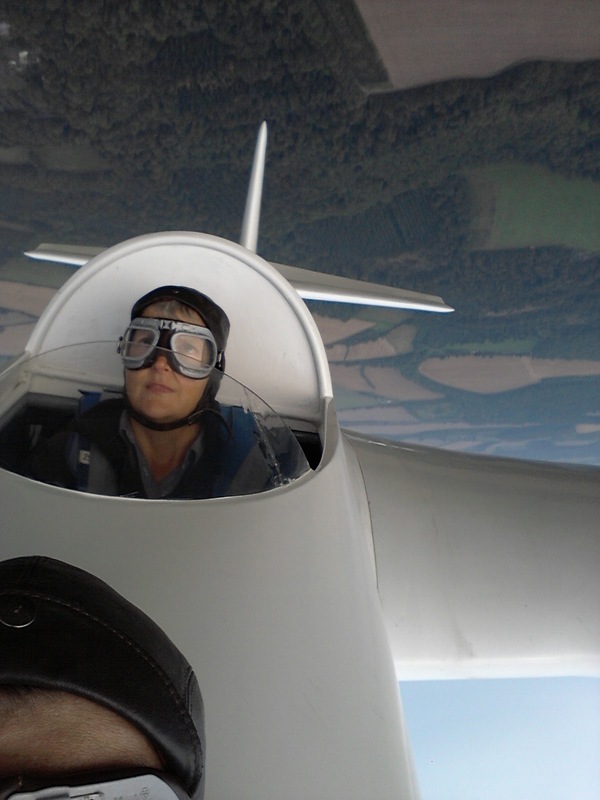 Meanwhile, the Cabriolet was out again on Sunday and Jane Moore expertly demonstrated her ability to loop without falling out of the open cockpit. And it looks like Richard felt it would be better for his career if he kept a low profile as Mini Gat demonstrates that style, and enthusiasm for gliding, clearly run in the family. Bonus point if you can spot what is wrong with this picture. It looks like the recent run of hot weather has finally got the better of the members. Todays sunshine meant that the only way to stay cool was to fly with the canopy off and CFA took to the skies several times with the 'Cabriollette' canopy. The Tuesday Evening Group have been up to their usual antics and using up all the available daylight hours as well as seeing the world from a different angle. The following excellent pictures taken by Sam Gervais say more than words can possibly do.